We had a blast this Super Bowl, in fact, Brian and I hosted our “3rd annual” Super Bowl party at our apartment complex and rented out our common room. We had a bunch of friends over and ate So much food! A “surprise guest” appeared, which made my night. You may know him if you are a fan of ABC’s The Bachelor and The Bachelorette but one of the Bachelors from JoJo’s season came and I was able to chat with him and got a picture – hehe! That totally made my night before they even won the game! Brian found his suit at Men’s Warehouse, although he has not officially purchased it yet. We ended up going with a Calvin Klein suit because he preferred to buy instead of rent. He and his groomsmen were able to get a good deal too. I am excited to help him pick out the bow ties. A couple more big things have happened over the last few weeks: We went wedding band shopping and picked out a videographer! 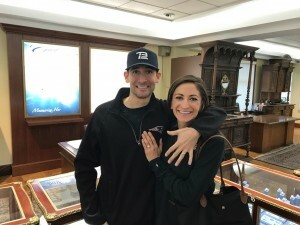 For the wedding bands, we went to the same spot where Brian picked out my engagement ring (Barmakian Jewelers in Nashua, NH.) It was a lot of fun watching Brian try on wedding bands for the first time (as he has never worn a ring before – as you can see from his facial expression in the photo.) With picking out the videographer, we ended up choosing someone who’s film style really resonated with us, he is Jonathan with 4th Henry Productions, based out of Rhode Island. We are really excited to work with him! Next Story → One month away!